“This soup has been a staple in my house for years. It’s ludicrously easy, absolutely scrumptious, and freezes well. If you want to cut down on prep time you could skip roasting the garlic, and instead, sauté 1 tablespoon minced garlic with the onions and salt at the beginning of the recipe. But, whole roasted garlic does bring an exquisite depth of flavor that’s hard to beat. Like the creamy cauliflower soup, blending in 1/4 cup of blanched almonds or raw cashews creams up this blend. For those of you following the Body Ecology Diet, use blanched almonds in place of the cashews, as they’re alkaline forming. Be sure to soak the nuts in the cooked soup and blend thoroughly to ensure the smoothest consistency. Resist the urge to add more spinach as it can make your soup watery. 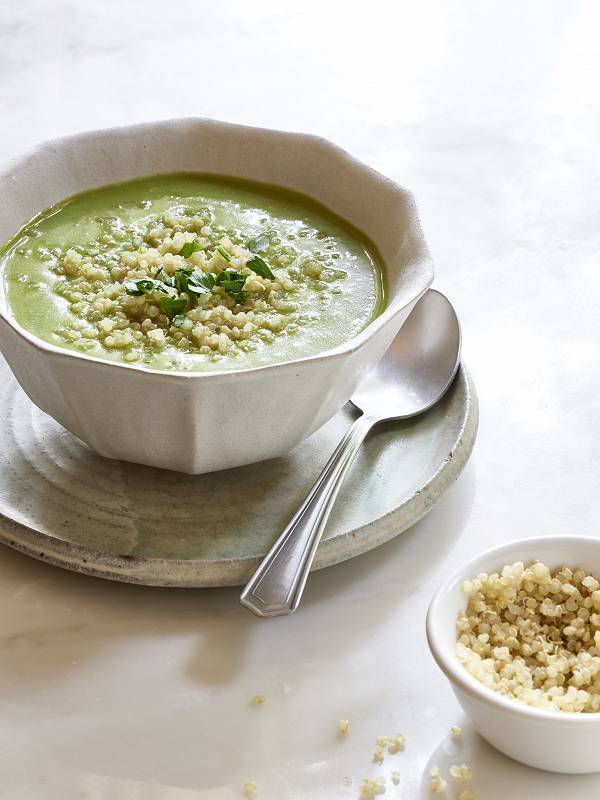 I serve this soup with a scoop of cooked grain (quinoa, millet, brown rice), but you may prefer some crusty bread. Cut off the top of the head of garlic, wrap the bulb in aluminium foil, and roast it on a baking sheet for 30 to 40 minutes, until tender. Allow the bulb to cool and then squeeze the garlic pulp out of the husks. This should yield 2 tablespoons or more of roasted garlic. Set aside. Heat the oil over medium-high heat in a large saucepan. Add the green onions, red onion, and 1/4 teaspoon of salt and sauté for 5 minutes, until the onions are translucent. Add the celery, zucchini, and parsley and sauté for 5 minutes more. Stir in the roasted garlic and the vegetable broth. Increase the heat to high and bring just to a boil. Reduce the heat to medium and simmer for 10 minutes. Add the spinach and simmer for 5 minutes more, until the leaves are just tender. Remove the saucepan from the heat and allow the soup to cool somewhat. Stir in the nuts. Pour the soup into your blender in batches, and puree on high for 30 to 60 seconds until smooth and creamy. Return the soup to the saucepan and warm over medium-low heat. Season to taste with salt and pepper and serve. The best tasting spinach has vibrant bright green leaves with crisp stems. This spinach also has the highest nutritional value. Purchase organic whenever possible!